I love a grilled steak. Getting the beautiful smoky char on the outside of the meat adds a great flavor and texture, but the grill is not your only steak option. Too many of my friends don’t think about cooking a steak “indoors”, but really there’s no reason they shouldn’t. In fact, pan roasting a steak gives you the opportunity to add some additional flavors that are harder to do on the grill. And, if you happen to be cooking other side dishes on your stove, it keeps you from having to run in and out of the house. In this demonstration, I show you how to pan roast a couple steaks on the stove top. I’m using a filet mignon and a New York strip, but the technique is the same for any cut. There are really three critical techniques to pan roasting a great steak. 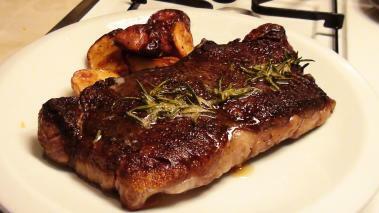 First, make sure the steak is well seasoned with salt and pepper before you start cooking it. Keep in mind, that a good amount of seasoning is going to fall off the steak and stay in the pan, so be a bit generous with the amounts. Second, make sure you get a good sear on the steak. You need to start off with a smoking hot pan, and once you put the meat in, you need to leave it alone so it gets nice and crusty. If your pan isn’t hot enough, or if you move the steak around too much, you’re not really searing, you’re steaming, and you’ll never get that nice crust. Finally, you need to cook the steak to the desired doneness. Getting the temp right may take some practice (I give you some tips below), but an over cooked steak is tough to swallow (pun intended). I like my steak medium rare, if you like a different temperature fine, but you do need to learn how to tell when your steak gets to that preferred temp. Regardless of what cut you’re using, you need to pay attention to the thickness of the cut. Thicker cuts obviously take longer to cook, and so you have more time to leave the steak in the pan and develop that outside crust. You also have more time to dilly-dally around and don’t need to pay quite as close attention to the steak. Thin steaks can go from medium to well done very quickly, so you need to pay close attention. Option 1 to Finish: The baste. As I do in this demo, to finish the steak, you can add a few tablespoons of butter, and perhaps some fresh herbs, and using a spoon baste the steak with the melted butter. This technique gets heat on both sides of the steak, and the nutty flavor of the herbs and brown butter add to the complexity of the meat. The steak will probably cook to medium rare in about 2 more minutes. Total cooking time 5 – 8 minutes. Option 2 to Finish: The oven. Alternatively, to finish the steak, you could put it in a 400+ degree oven for about 5 more minutes. The benefit of this approach is it’s less labor intensive as you’re not standing over the steaks basting. Total cooking time 6 – 10 minutes. Once you’ve cooked a few steaks this way, you’ll learn to tell doneness just by feel. Poking the steak with a finger, you can test the firmness of the meat. The more firm the closer to well done. Your first few times, use a meat thermometer. I like my steaks around 125 internal temp for a medium rare, and 5 – 10 degree increments will get you through the stages of medium, med-well, and so on. You should avoid cutting into the steak to “look” at the inside. Once you cut, the juices will start flowing out, and you’ll end up with a dry steak. Pull the steaks off when you have the desired doneness, and wrap them in foil for about 5 minutes. This process is called resting, and allows the “excited” juices to settle down so that when you cut into the steak, all the juice doesn’t flow right out. This resting period is a great time to make a pan sauce. After the steaks rest, you’re good to go. Some juice will have seeped out of the steak and collected in the foil, you may want to drizzle that juice back over the steaks when you server, or add them to the a sauce. Love the easiness that is put into the steps of cooking it in doors. Thanks just got my own place and never really cooked (besides waffles and homemade pizzas). What kind of oil did you put in the pan? Just regular Olive oil? Or is it some other kind? I've found plain vegetable oil to be best personally. Doesn't give much off in the way of flavor and it has a higher smoking point than olive oil. Works wonders with the butter basting method, which is by far my favourite.